All riders must take part in team trials to be part of CUET 2017-18. 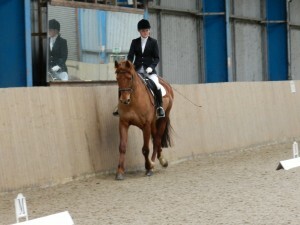 Selection for the team is based on riding ability as seen at trials, and relevant experience and competition record. To trial for the team you should be comfortable riding a wide variety of horses of different temperaments and standards. For the team competitions it is necessary to be able to ride an Elementary level dressage test and complete a course of 3’6” show jumps. If you haven’t competed at a high level though, please do not be put off from applying to trial – many talented riders may not be able to afford good horses! For 2017-18 there will be a CUET squad consisting of three teams of 4, plus 2 reserves. Those selected for the squad, including reserves, must become members of CURC (competitive membership: £36/year). Once selected, it is important that you are able to train regularly (minimum of 4 sessions per term) and attend the BUCS matches on Wednesdays (4 per year) and Varsity (unless exceptional circumstances, in which case reserves will compete). There will also be socials for the team and clinics with outside professional riders – it would be great to have the whole squad getting involved with these. The club pays for our competition entry fees and the hosting of our home match and Varsity. However, contributions to travel costs to matches can mount up and the training (£26/session) and purchase of team clothing is self-funded. I am currently trying to source sponsorship to help with these costs. So please do not be put off trialling if you are concerned about the cost of competing, I am very aware that riding is an expensive hobby and trying to reduce this issue! Trials will be on October 22nd 2017. Costs are normally around £15, with an additional contribution towards fuel costs for drivers. They will take place at Hilltop Equestrian Centre in Yelling. If you are interested in trialling for CUET 2016-17, please contact Kate Branley (cuet.captain@gmail.com) for more information or come see us at freshers fair.